Got this one in the mail from 43rd BIG IDEA Records. Never heard of JR BOY but I’m glad I did .. he’s the real deal, y’all. Guitar player from Texas .. and a great singer. Great songwriter too .. “I Got You On My Speed Dial” is cool .. and the band is pumping .. the keyboard player does a monster ride on “G Thang”. Love the production .. great sound. 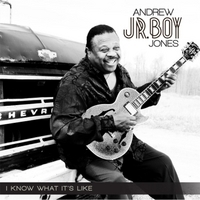 Folks, this is a great blues album .. you can get it from CD BABY .. check him out on facebook .. good stuff ..
4½ stars for this one .. it’s damn near perfect ..
Here’s the bio for JR BOY ..
Andrew ‘Jr. Boy’ Jones was raised in Dallas, Texas, by his mother Gladys, who was a single parent after divorcing her husband when Andrew was very young. The singer for a big band, Gladys retired to raise her family, and the band’s leader, Adolphus Sneed, stayed with the family as a father figure. Andrew received his first guitar from his mother for his seventh birthday, and he practiced every day. After noticing Andrew’s talent, Sneed bought him his second guitar. Andrew has amassed more than 50 years of experience as a professional guitar player. ‘Jr. Boy’ was in his first professional group, the Thunderbirds, backing Freddie ‘The Texas Cannonball’ King by age 16. In the ’60s, ‘70s, and ‘80s, ‘Jr. Boy’ toured the world with several music legends, such as Johnnie Taylor, Tony Coleman, Cornell Dupree, Little Frankie Lee, Bobby Patterson, Russell Jackson, B.B. King, Katie Webster, and Charlie Musselwhite, to name a few. In 1996, Andrew began his solo career and also released the ¬first album in which he was featured as a vocalist as well as a guitar player. He has since released fi¬ve more solo albums, one of which he released from his own label, GalexC Records and his only live album on 43rd Big Idea Records. ‘Jr. Boy’ has been touring extensively with his blues band all over the country for the past two years, performing at several venues in and around the Dallas area. Andrew and his band have also performed at large festivals, such as the Texas Blues Radio Annual KNON Blues Festival, and international events like the Ottawa Blues Festival.